survive temperatures as low as 0 degrees centigrade but when it gets really cold, it likes snuggling with humans or any other warm body. recognise members of its own family just by their smell. While for cockroach, it only takes 10 times more dose to kill it. The rad is a unit of absorbed radiation dose in terms of the energy actually deposited in the tissue. The table below shows typical dose examples. 1 krad is 1000 rad and 1 Mrad is 1000000 rad. 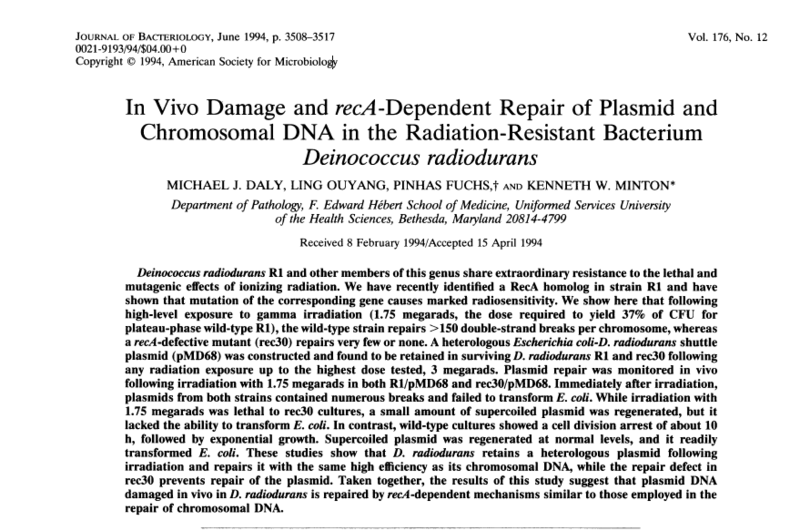 Deinococcus (formerly Micrococcus) radiodurans Rl was discovered by Anderson and coworkers in X-ray-sterilized canned meat that was found to have undergone spoilage. Culture yielded a red-pigmented nonsporulating gram-positive bacterium that was extremely resistant to ionizing radiation and many other agents that damage DNA. The deinobacteria are the most ionizing and UV-radiation-resistant organisms known, with full survival reported at exposures of 0.5 to 3 megarads (mega is a million), which is 10 times higher than killing the parasitoid wasp, Habrobracon. that its extreme resistance is attained via extraordinarily efficient DNA repair (Moseley, B. E. B. 1983. Photobiology and radiobiology of Micrococcus (Deinococcus) radiodurans. Photochem. Photobiol. Rev. 7:223-274.). For example, ionizing radiation produces double-strand breaks (dsb) in the DNA of D. radiodurans with the same efficiency as in the DNA of other organisms; however, wild-type D. radiodurans can mend >100 dsb per chromosome without lethality or mutagenesis, whereas most other organisms can repair no more that 2 or 3. Daly et al., were able to isolate a mutant strain which is sensitive to radiation and in this paper they report that a key protein is missing in the mutant which prevents the DNA repair. Since then there has been several papers on Deinococcus and can be searched on Pubmed.